The small bar was always packed. Don’t ask me about the sushi…I enjoyed taking photos, but sushi is not one of my favorite types of food. This entry was posted in Uncategorized and tagged kauai, photography, round, sushi bars, travel, travel theme. Bookmark the permalink. Are those flowers blown glass. 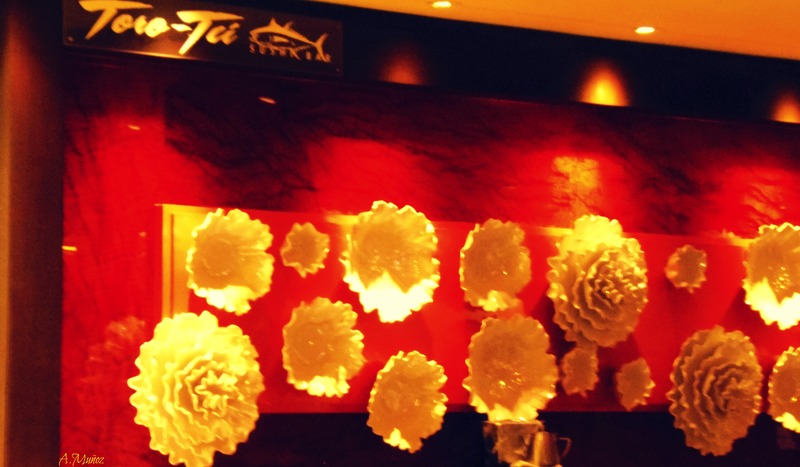 They decor in the sushi bar is beautiful. I like sushi, The decor is always very elegant yet simple. They did not look like blown glass at all, but some sort of ceramic or porcelain maybe. Sushi bars usually are simply decorated, I like the minimalistic settings. Thanks, Isadora. So often it’s the food that’s presented so beautifully at a sushi restaurant. This has to be one of the best decorated sushi restaurants that I’ve ever seen. Great shots, Angeline. Thanks, John. Presentation and environment is everything. Thanks, Jane. The lighting and the color just came together! I am surprised by more people here on this post saying they also don’t like sushi. Here in California I must be one of the few people who dislike it. It’s a little lavish, Angeline 🙂 No sushi for me either, thanks! Thanks, Amy; they were some kind of ceramic.